The kids have fallen prey to the power of advertising and marketing - and learned that just because the product in the ad looks delicious and is something to be enjoyed, that isn't always the case. 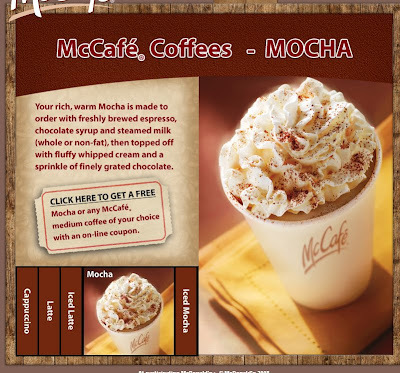 Just a week ago, the notion of Gourmet coffee from McDonalds did not register anywhere in our brains. Then the marketing and advertisement blitz started - billboards displayed at the Illini game, radio spots, and the ad insert in Sunday's paper. The kids read Sunday's ad insert with much interest and started to salivate over the prospect of having a warm, chocolaty Mocha. Erica taped the ad to the kitchen wall. Every morning both she and Brian asked if they could have a Mocha from McDonalds, pointing to the ad and reading the description of how the Mocha is created (see the above picture). I promised they would have their luscious Mochas on Saturday. So, here we are, Saturday morning, and what is the first thing out of their mouths this morning? Not "good morning, Mommy - we love you! ", but "Mom - where are our Mochas??? - Go get our Mochas!". Geez - I can't get them to remember to bring their dirty dishes to the sink, but they remember that today is Mocha day! I realize that they have been drawn into the power of McDonald's advertising ploy. I KNOW my kids don't like coffee, I KNOW that all they really want is a nice Hot chocolate with whipped cream. Heck, all they really want is just the whipped cream! But I know that if I don't go out and buy those Mochas, there won't be an end to their obsession. I drove to McDonalds and bought 3 medium Mochas (Scott wanted one, too). I would have purchased one for myself, but I hypothesized that after a couple of sips, Erica and Brian would be willing to part with theirs. How fun to read of your kids pursue of the Moccha. You are witty!! Did they learn anything? What a fantastisc music you have. Who is singing?? I must have!! Finally! A Win for Brian's Team!